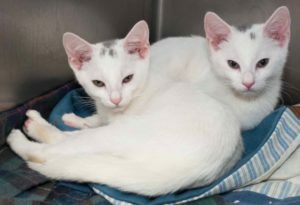 Arthur is all white with two gray spots on his head and is pictured here with his sister, Guin (who is all white with 3 gray spots on her head). 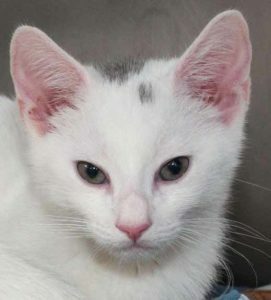 Born in April 2016, Arthur is an adorable, playful, and lovable boy rescued by a concerned citizen with his 3 litter mates from a rough beginning in life. Home fostered and provided with excellent care and socialization, Arthur and his siblings are love bugs looking forward to finding their Forever homes! Anyone or two of them will make an awesome addition to your life!